Barossa Valley in a hot air balloon. The Barossa Valley is one of the most spectacular winery regions in Australia, and one of Australia’s premier ballooning locations. Getting married in a balloon is undoubtedly a unique and memorable way to spend your special day. After your flight celebrate with a gourmet breakfast at our beautiful new purpose built ballooning building, toasting your new partnership with Barossa sparkling wine. 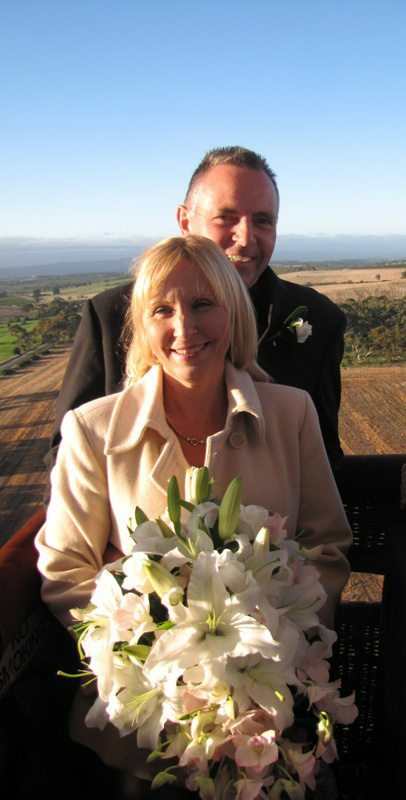 At Barossa Balloon Adventures we have put together a wedding package for those romantics who would like to experience a high flying wedding celebration!! As ballooning is a weather dependant activity, you may want to arrange a back-up ceremony should the balloon flight be cancelled due to inclement weather on the morning. If you are interested in this package, please contact us 08 8562 3111.